It’s almost Children’s Day! The 4th of April is dedicated to the little ones around us. Stop the hard work for this special day and give back to the children around you. Every day with them is a blessing. We hope that the kids will grow up healthily and happily, and Buyandship wants to celebrate Children’s Day with you! 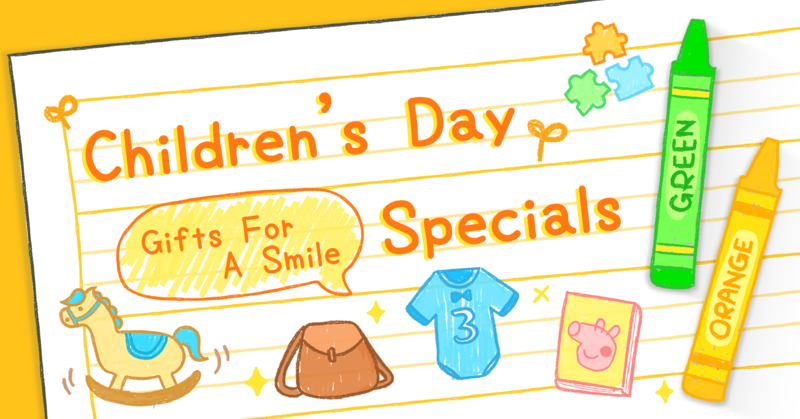 We created a shopping guide for Children’s Day; no matter if the little ones are 3 years old, or 20 years old, there will be something suitable for all of them! And of course, even as an adult, you can receive gifts! Treat the children around you and treat yourself on this special day, and experience the happiness of being a child again! It’s the little ones first ever Children’s Day and you want to give a special gift? UK brand ‘My 1st Year’ will be your destination, with toys, dolls, little instruments, building blocks, etc. All suitable for children in their first year. They also offer a special engraving/embroidery service, to make the gifts extra special and unique. Did you also watch Thomas the tank engine growing up? This Thomas the tank engine gadget will light up any children’s eyes! Suitable for children aged 1 to 3, with a maximum load capacity of 40 pounds. Designed to grow with the baby in three stages, Skip Hop’s Silver Lining Cloud Baby’s View Activity Center is their bestseller, suitable for children of 4 months and above, and it features a 360-degree rotating seat that turns and stretches for bouncing. This Anpanman toy car is suitable for children from 10 months up to 5 years! And it also makes a great learning toy: in the beginning, the little ones can be pushed by the parents, and then slowly learn how to use their own feet and lead the way! If at home or on the go, these magnetic buildings blocks are easy to take with you! One set includes 8 blocks, and you can simply buy more sets, to let the little ones build higher blocks! This building block set is suitable for ages 1 and above! These practical Jetkids Suitcases not only store all your clothes and toys but let’s our little impatient travelers sit on it, during waiting times at the airport! They come in many different colors and your little travelers are gonna love them! Now you can build sandcastles without going to the beach! Kinetic Sand is made out of real sand, super squeezable and never dries out. And because it magically always sticks together, the parents will be happy too, because it’s mess-free! You can never go wrong with the Classic-Lego gift, you can find different categories for different ages and collaborations with Disney characters, Harry Potter and more! It’s a classic toy for kids that has been popular for decades! STEM means Science,Technology,Engineering,Maths which combines play and science into fun and interesting toys! These will help kids forming a skill set that will help them in the future! Find everything from toys, clothing, accessories, baby gear, vacation articles, and home articles with your kids favorite Disney characters in the US Disney store! They are currently offering a free gift for every purchase of US$50! After playing with all the toys, we want the kids to be motivated to tidy up and put it back into their storage boxes. The motivation will surely be higher with cute storage boxes like this Toy Story Storage Box or Disney Princess Storage Box! Additionally to Lego, K’NEX is another popular build-up toy. It let’s you build 3D models and is suitable for children age 7 and higher! Plus K’NEX can also be used for quality time with the whole family. Pokemon fans around? Shop the Japanese Pokemon Center online and find accessories, toys, stationary all around Pokemon here! Cath Kidston also designes clothing and accessories for kids. The kids collections even has collaborations with Disney! Make your little ones extra fashionable with backpacks, clothing and daily necessities of this popular UK brand! Hell Puzzle can be seen as the advanced version of the regular puzzle. Hell Puzzle is not only fun, but it also trains your children endurance to keep solving this puzzle to the very end! The older the kids turn, the more they will care about their outer appearance. Marks and Spencer UK offers good quality, fashionable clothing for adults and kids, that will not break the bank. Which Boy (and often also girls) doesn’t like football and has a favorite team? Football-Max has you covered with Jerseys from all football teams and more! UK online shop Zalando offers everything from casual clothing brands to even high-end brands and major sports brands. And they also have a huge selection for kids! No matter what you are looking for: trousers, sneakers or simple tee’s you can find it on Zalando! The PS4 is by far one of the most popular toys for teenagers and young adults. How about adding a customized PS4 controller to make your own PS4 stand out even more, plus, this controller is known to be easy to handle and use. Board games are the most classic games. Perfect for the whole family or a group of friends it’s not only fun but also trains the community spirit. The cult board game Monopoly comes in many different editions and versions! Anime and Comics are very popular for teenagers and young adults, this Japanese online shop has a big variety of models and figures of different genres: if you are looking for an action hero, anime figure or anything else, you will find it here! Young Adults have grown up with Tech and electronic gadgets since they were born, and Japan is the best for innovative new tech items on the market! Shop Japanese online shop for the newest cameras, tablets, laptops, and tech accessories!